The pilot of a Mozambican airliner that crashed in Namibia last month deliberately brought the plane down, aviation experts in Mozambique believe. Mozambican Airlines flight TM470 left the capital Maputo bound for Angola on 29 November, but crashed, killing all 33 people all board. The Civil Aviation Institute said the pilot made a "deliberate series of manoeuvres" causing the crash. The pilot's motives are unknown, and the investigation is continuing. The plane went down in heavy rain in Namibia's Bwabwata National Park. But the head of the Civil Aviation Institute, Joao Abreu, told a news conference that the pilot, Hermino dos Santos Fernandes, had a "clear intention" to crash. Dos Santos Fernandes locked himself in the cockpit, and did not allow his co-pilot back inside until moments before the plane hit the ground, Mr Abreu said. "During these actions you can hear low and high-intensity alarm signals and repeated beating against the door with demands to come into the cockpit," he was quoted as saying by state news agency AIM. "The reasons which may have given rise to this behaviour are unknown." Investigations also showed that Dos Santos Fernandes manually changed the aircraft's altitude three times from 11,500 metres (38,000 feet) to 180 metres (592 feet). He also manually altered the aircraft's speed. Earlier this week, Namibian investigators said they had detected "no mechanical malfunction" that could have led to the crash, and the plane was one of the newest in the airline's fleet. 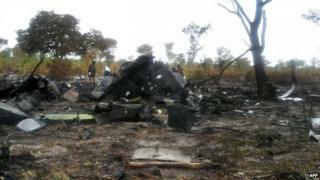 The 33 people who died included passengers from Mozambique, Angola, Portugal, Brazil, France and China. Mozambican Airlines is currently banned from airspace in the European Union, along with all other carriers certified in Mozambique, because of safety concerns.